There’s a proverb that says – home is where the heart is. In New York City there are a few people that have gone a step further and opened up their homes for visitors to take a glimpse into their own abodes of affection ….and art collections. Here are 3 stand out open houses and some tips based on our experiences. Industrialist tycoon Henry Clay Frick always had the intention to leave his house, opposite Central Park, and his art collection to the public. His well-placed confidence now enables the public to enjoy a unique way to appreciate masterpieces from the likes of Manet, Rembrandt, Degas and Turner, still arranged as Henry originally had. 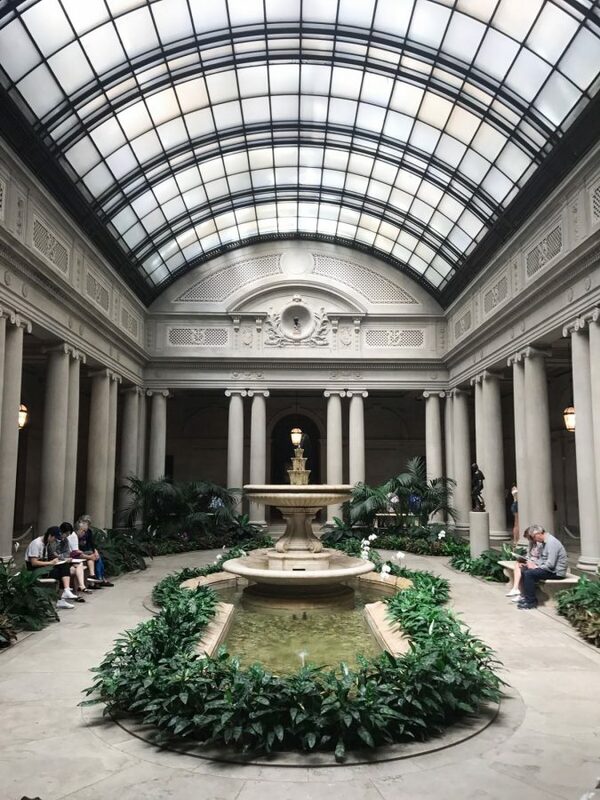 Be sure to visit the Garden Court, a gorgeous courtyard with a fountain and natural light where you can sit whilst contemplating the Frick family’s daily activities. It’s also the only spot in the house where one can take photographs. $22 entry fee can be avoided if you go on the First Friday evening of the month (except September and January), from 6 -9 p.m. Also Wednesdays between 2-6pm is pay what you wish. In 1924 J. P. Morgan Jr. gave his father’s extraordinary library to the public in accordance with his father’s last will & testament (John Pierpont Morgan was worth $46 billion from his days as a banker and financier!). Today, we have full access to Morgan’s 1906 library, which has been breathtaking preserved in all its original splendour. Additions over the years now allows The Morgan complex to serve as a museum and scholarly research centre, as well as a music venue. If all this culture makes you hungry during your visit, consider two dining options – The Morgan Café or the Dining Room. Finish your day at the Morgan Shop, located in J.P. Morgan Jr.’s former brownstone mansion. Museum admission is not required to visit the eating facilities. Highly recommend the free hourlong “highlights” tour of the permanent collection are available Tuesday to Sunday at 12:30 p.m.
Time for a splash of yellow? Go to this “home” that was originally built for the industrialist William Starr Miller in the early 1900s and you can get a glimpse of Klimt’s portrait of Adele Bloch-Bauer I (made more famous by the movie The Woman in Gold starring Helen Mirren). If you’re devoted to early twentieth-century German and Austrian art and design, this gallery is perfect for you. It was conceived by two mates. An art dealer and museum exhibition organizer Serge Sabarsky and heir to Estée Lauder cosmetics, Ron Lauder. Free, forty-five-minute tours that covers the highlights of the permanent collection and the special exhibition start at 3:30 p.m. Friday, Saturday, Sunday and Monday. To avoid $22 admission charge, go from 6 p.m. to 9 p.m. on the first Friday of every month. Hungry? There are two excellent restaurants – Café Sabarsky or Café Fledermaus. There is plenty of evidence highlighting that creativity makes you more productive, better leaders & workers and happier. Creative Cities 21 re-energise people through creative escapes in great cities of the world. The program combines the best elements of immersive travel and workshops in painting, acting and innovation, providing a unique, fun and impactful creative learning experience.